The NCFS has Class A foam available for purchase by North Carolina fire departments. The foam can be used on all Class A fires and can greatly increase the wetting capability of water. Astaris Phos Chek is currently the only available brand for purchase. NCFS obtains the foam through a blanket purchase order which results in substantial savings. The foam is then resold at cost to fire departments by the agency. 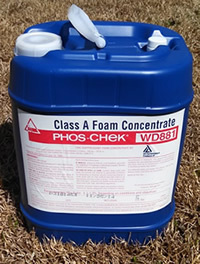 The current price for the foam is $90.55 per 5 gallon pail. If interested in purchasing the foam, contact your county forest ranger or submit an order form.